Give the gift of family music! You can choose any amount to gift to your loved ones to put toward their music classes. Gift certificates for holidays, birthdays, anniversaries, new baby and....any time is the perfect time to gift music classes. It truly is the gift that keeps on giving. 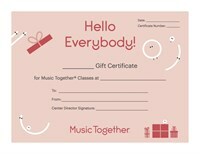 So many of our families say that they LOVE the gift of music classes and keep requesting it from loved ones. Questions about our program and curriculum? Don't hesitate to call! Copyright © 2019 Bebop & Bundles. All rights reserved.